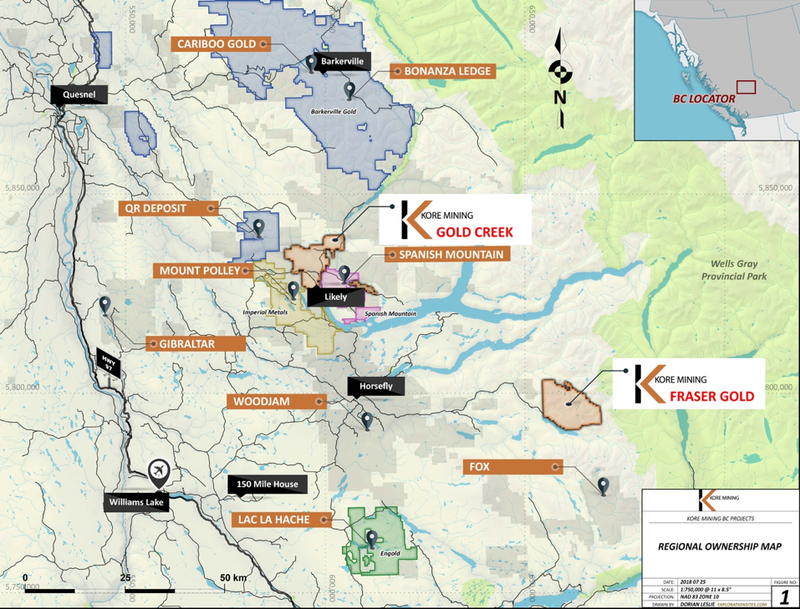 VANCOUVER, Nov. 13, 2018 /CNW/ - KORE Mining Ltd. (TSX VENTURE: KORE - "KORE" or the "Company") is pleased to announce completion of Phase 1 drilling on the Gold Creek gold exploration project, extension of the Camp Zone of over 300m, and the discovery of visible gold in 2 of 4 drill holes1. First hole GC18-36 intercepts 25.7m of 1.3g/t, including 3 metres of 8.6g/t gold near surface. Confirms extension of potential for a large resource within an 8.5km long arsenic-in-soils anomaly. Visible gold was observed in the 3rd (GC18-038) and 4th (GC18-039) hole of the campaign, with visible gold in 2 locations within GC18-039, with assays pending on both holes2. 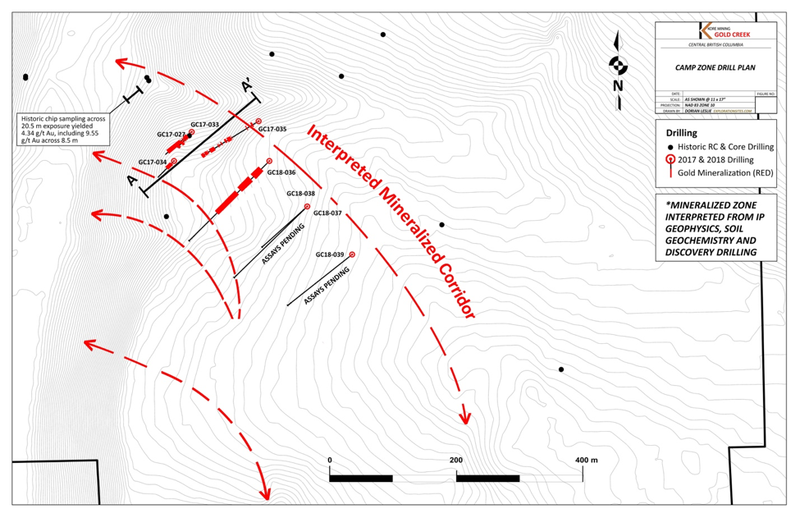 Drilling extends the Camp Zone 300m along strike and is open ended along strike and at depth. "These results demonstrate broad zones of gold mineralization with higher grade in step out drilling. This confirms the association of gold with a recently interpreted 8.5km long trend and the potential for discovery of a significant resource," said James Hynes, KORE Director and COO. A total of 4 HQ drill holes for 940 meters were completed within the Camp Zone to test strike length extension of the successful discovery drill program completed in 2017. These holes step out approximately 300m from previous drilling. The 2018 drill program followed up on sedimentary hosted near surface and higher grade vertical stockwork, veins and veinlets within the lower grade halos. All 4 of the holes encountered broad zones of alteration and mineralization within a Triassic Upper Nicola greywacke, interbedded with argillites, mudstones, and conglomerates. Mineralization consists of quartz-pyrite-carbonate veins and veinlets with variable amounts of arsenopyrite, chalcopyrite, galena, sphalerite, pyrrhotite, and native gold. Where observed, native gold occurs as ≤1 mm fine-grained, free individual crystalline grains along the walls of quartz veins, on the edges of cubic pyrite crystals, with limonitic pyrite, and occasionally with galena. Pyrite is the principal sulfide mineral in the mineralization, occurring within quartz veins, in envelopes of 5-10% pyrite adjacent to quartz veins, and disseminated 1-3% in the host rock. The quartz-sulfide veins strike southeast, dip steeply or vertically, are generally sub-parallel, and occur as individual veins and as zones of stockwork. Veining and mineralization are accompanied by quartz-sericite alteration, carbonate alteration, bleaching, and silicification in the wall rocks surrounding veins and stockwork. Host rocks consist of interbedded greywacke and argillite with minor conglomerate and mudstone beds. Maps, sections and a table of drill holes completed this year with notes on targets tested are attached to this news release and posted on www.koremining.com. The Gold Creek project is located 2km NE of the town of Likely in the Cariboo – the heart of British Columbia's historic "Gold Rush" district. The Gold Creek project consists of 34 claims totalling 9,673 ha located approximately 8km to the NW of the Spanish Mountain gold deposit. Access is from Likely by all-weather gravel road. The site has well developed infrastructure and is just 70km NE of Williams Lake, a major regional centre serviced by an airport and railway. The property has several small roads that will provide easy access for drilling the claims. 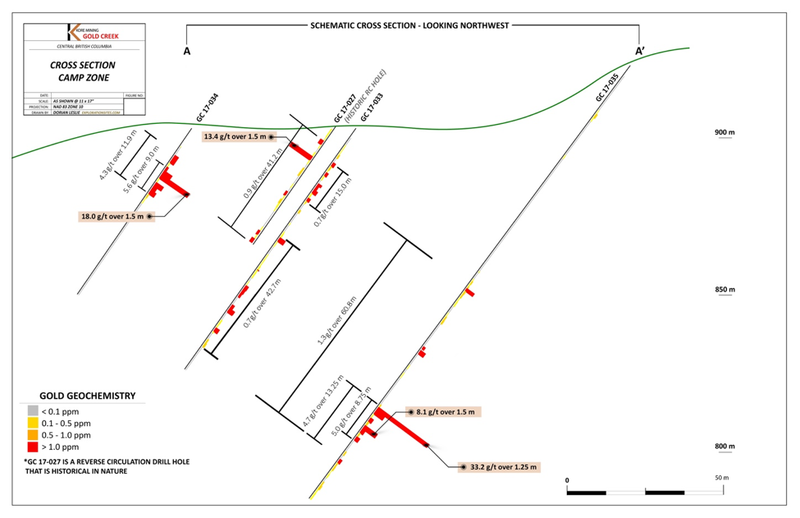 Compilation of historical drilling, soil sampling, and geophysics were completed by KORE to determine a positive correlation between gold mineralization and either pathfinder elements, geophysical anomalies, or both. 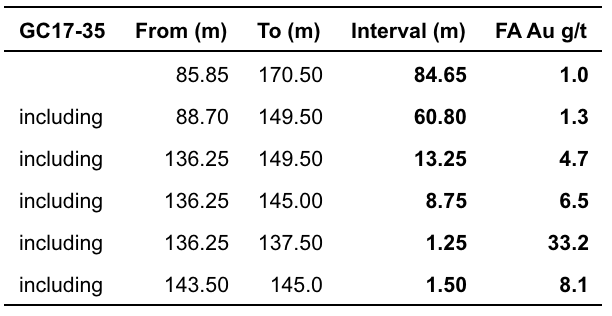 Historic drilling in 2011 and 2017 confirmed large widths of mineralization in silicified greywacke from surface with multiple higher grade vein intercepts within a lower-grade halo. Intercepts included 1.5m of 13.4gpt (GC11-27 10.7m to 12.2m), 9m of 5.5gpt (GC17-34 16.0m to 25.0m), including 1.5m of 18.0gpt, and 84.65m of 1.0gpt (GC17-35 85.85m to 170.50m), including higher grade intercepts. See appendix for historic results. 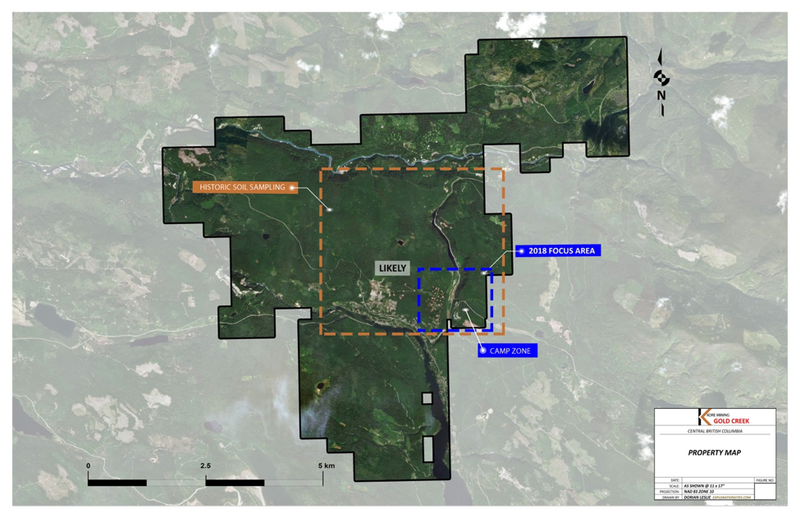 The Company has observed gold mineralization to be closely correlated with elevated arsenic and contained within a greywacke unit of high resistivity and low chargeability relative to the adjacent argillite unit. 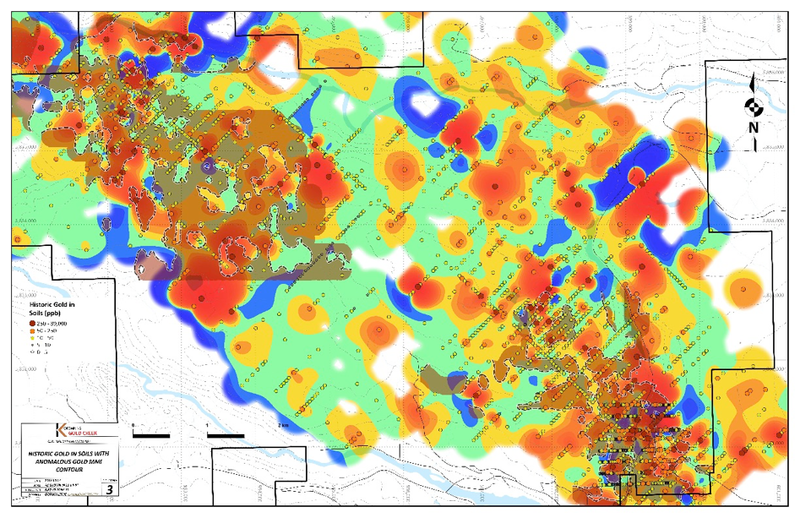 Review of the 3 HQ core drill holes from 2017 performed by Eureka Resources confirms that broad zones of gold mineralization are closely accompanied by elevated arsenic levels. 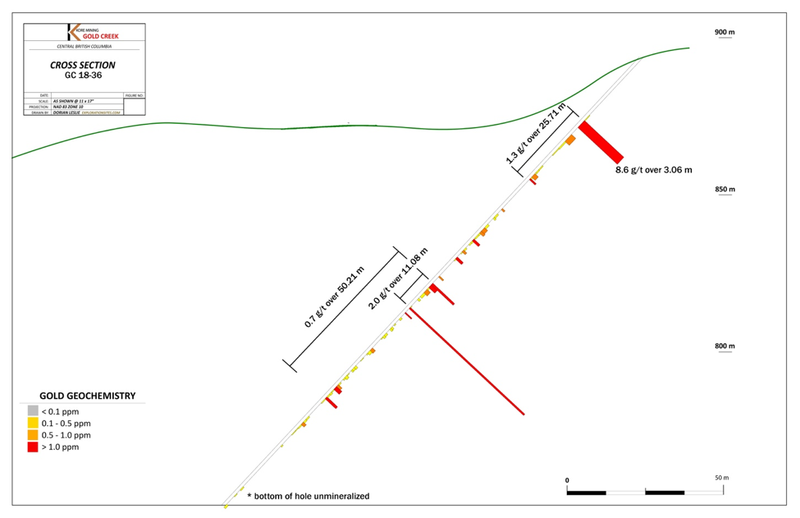 Previous drilling had targeted gold in soil anomalies on the property. While these gold in soil anomalies exhibit quite high gold in soils (as high as 89,000 ppb), these anomalies appear to be discontinuous due to varying thickness of glacial till which covers the majority of the property (see compilation map of historic gold in soils). Arsenic in soils show more coherent anomalies, and appear to be the best pathfinder element for the mineralized greywacke unit. Compilation of historic arsenic in soils (see compilation map of historic arsenic on soils) highlights an 8.5km long NW-SE trend that is coincident with the NW-SE trending Camp Zone and the recent drilling. This 8.5km long anomaly provides numerous additional drill targets for evaluation. Once the drill core was received from the drill site, individual samples were determined, logged for geological attributes, sawn in half, labelled, and bagged for assay submittal. The remaining drill core was then stored at a secure site in Horsefly, BC. The Company inserted quality control samples at regular intervals within the sample stream which included blanks, preparation duplicates, and standard reference materials with all sample shipments intended to monitor laboratory performance. Sample shipment was conducted under a chain of custody procedure. The QAQC program was designed, approved, and overseen by Kristian Whitehead, P.Geo. Drill core samples were submitted to ALS Minerals' analytical facility in North Vancouver, British Columbia for preparation and analysis. Sample preparation included drying and weighing the samples, crushing the entire sample, and pulverizing 250 grams. Analysis for gold was by method Au-AA26: 50g fire assay fusion with atomic absorption (AAS) finish with a lower limit of 0.01 ppm and upper limit of 100 ppm. Samples were analyzed for 33 additional elements with method ME-ICP61 (four-acid digestion). Overlimit values other than gold were re-analyzed by methods ME-OG62 (four-acid digestion) and Cu-OG62 (ore-grade copper with four-acid digestion). ALS Minerals is accredited to the ISO/IEC 17025 standard for gold assays, and all analytical methods include quality control materials at set frequencies with established data acceptance criteria. Parameters for ALS Minerals' internal and Kore's external blind quality control samples were acceptable for the analyses returned. KORE Mining is a development stage company that offers exposure to precious metals exploration and development in North America, with a corporate strategy focused on advancing its California development and British Columbiaadvanced exploration stage projects. KORE owns 100% interests in the Imperial and Long Valley gold development projects, located in California, USA(together, the "Projects"). Most recent current resources specify a total of 1,247,000 measured and indicated and 486,000 inferred gold ounces on the Long Valley project. An historic proven and probable reserve, feasibility study and environmental impact statement and report exists on the Imperial Project. A Qualified Person has not done sufficient work to classify the historical estimates as current resources and KORE is not treating the historical estimates as current resources. Significant data compilation, re-drilling, re-sampling and data verification may be required by a Qualified Person before the historical estimates at the Projects can be classified as current resources.